The mere thought of breaking rules is a little bit seductive, like sneaking a chocolate-iced Krispy Kreme doughnut when you’re on a diet, or falling in love with a vampire bad boy. Of course, not all rules are fun to break. Sticking a finger into an electrical socket or driving on the wrong side of the road is just unwise at best. 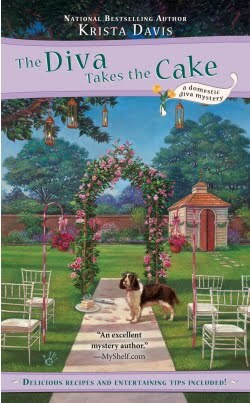 In the Domestic Diva Mysteries, Sophie Winston and her best friend Nina Reid Norwood would say they follow rules. Except for the stupid ones. And that drives Natasha (one name, please, like Cher) nuts because she thinks she’s the Martha of the South, and that Sophie really doesn’t qualify as a domestic diva because she won’t follow the rules. Sophie would laugh at her because she believes in keeping things simple. She doesn’t send friends and family formal invitations. They know they’re invited. And a blue or red tablecloth would be just as festive as blue tiles. Sophie defies the new rules of domestic divahood which infuriates Natasha. No one gathers in Natasha’s perfect, sterile kitchen. They come to Sophie’s house (just down the block) where a fire crackles in the kitchen fireplace on cold days, and there’s always something good to eat. This time of year, you’ll find Sophie and her friends gathering on her patio around watermelon margaritas and spiced shrimp. Natasha believes in rules and is always the first to point out Sophie’s failings when it comes to being a domestic diva, or anything else for that matter. Yet, it’s Natasha who broke the cardinal rule of girlfriends. A rule so big that it’s right up there next to thou shalt not kill. Natasha set up housekeeping with Sophie’s ex-husband. Sophie likes to think that her marriage was already over, but her family and friends aren’t so sure. Natasha is paying for her wrongdoing, though. She’s finding that the trouble with stealing someone’s husband is the constant worry that he might just wander back to his old love, especially since Natasha hasn’t been able to convince him to tie the knot. Sophie and Nina would never betray a girlfriend that way, but they’re not beneath sneaking into someone’s house or office for a little snooping when murder is involved. Definitely illegal, but it sort of pales in comparison to wrecking a marriage. Does it seem like it’s lower on the scale of rules that can be broken because they’re trying to right a wrong by catching a killer? Or because that unwritten rule of girlfriends is of the highest order? Sneaking a forbidden Krispy Kreme doughnut is about the extent of my rule breaking. But don’t worry about Sophie, one of these days Natasha’s finger may just find its way into an electrical socket. National bestselling author Krista Davis writes the Domestic Diva Mystery series for Berkley Prime Crime. 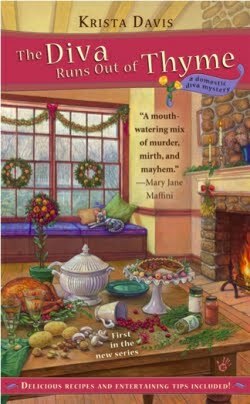 Her first book, The Diva Runs Out of Thyme, was nominated for an Agatha award. 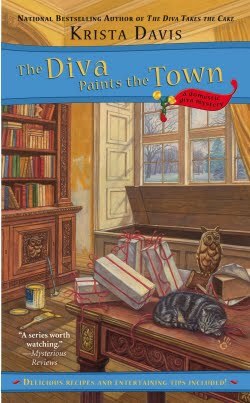 The Diva Paints the Town was released a few months ago and The Diva Cooks A Goose will be in bookstores in December. 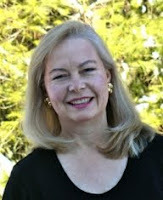 Learn more about Krista's books at http://divamysteries.com and visit her at http://mysteryloverskitchen.com, where she blogs on Saturdays, as well as a fun new blog written by characters in cozy mysteries http://www.killercharacters.com. My rule for domestic practices: everybody gets to make up their own. Sometimes I want to go all Martha Stewart on a holiday or something. If I do, it's my responsibility and no one else is beholden to follow my rules. The result? The odd MS caliber experience with Sophie's full and happy kitchen. Thanks for blogging for us today! Thanks for dropping by, Krista! My entertaining "rule" is that it shouldn't be stressful. If I can get in a nice DIY touch that's great, but if it would take away too much from my time reading a good mystery, then it's not going to happen! Lynn, thanks so much for inviting me. More people should have your attitude. I think too many people try to do everything and make themselves miserable in the process. Gigi, it was lovely of you to invite me to blog. I love your entertaining rule. Stress-free is always good. But entertaining does cut into mystery reading time . . .
Janet, I love informal gatherings in the kitchen, too. I'll talk to Sophie about inviting you for midsummer's night. I suspect Natasha's mother will be out dancing in the moonlight! Thanks for coming by Krista. I'm pretty domestically challenged, so my only entertaining rule is keep the wine flowing and no one will notice. Rachael, you may have enjoyed them, but I'm pretty sure they landed on my hips! I wish Sophie lived on my block! Thanks for a lovely visit.